Pop quiz: you’re in charge of a giant digital game store, and suddenly there’s a controversy revolving around how and when people display the U.S. Confederate flag. Do you A) do nothing; B) assess all of your games on a case-by-case basis; or C) remove games that show the flag in any way? If you said C, you probably work for Apple, the mega-corporation behind all things iOS. Apple is notoriously skittish when it comes to the App Store, often censoring and banning games that show naked people (in any context) or use gun imagery in their marketing materials. So it’s not a surprise to see the company reacting to recent controversies—specifically, questions over the Confederate flag’s symbolism in the wake of a mass shooting at a black church in South Carolina last week—by burning everything to the ground. 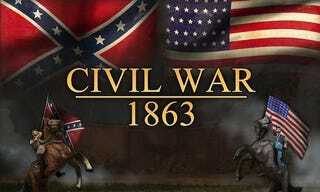 Today, Apple decided to start yanking games that use the Confederate flag in any way (via TouchArcade). For example, you can now no longer buy the strategy iOS games Civil War: 1862, Civil War: 1863, Civil War: 1864, and Civil War: Gettysburg, which, as you might guess, use the Confederate flag because they’re video games about the Civil War. Andrew Mulholland, director of these Civil War games, told me this morning that Apple pulled them today without any warning. I imagine that any rational person would see the difference between, say, a family hanging the flag outside their house as a sign of pride and a video game using the flag in the context of the Civil War. But over the years, the App Store’s curators have proven themselves to be anything but rational, censoring on a whim while making very little effort to thwart the iOS clone epidemic that has driven many developers away from Apple entirely.